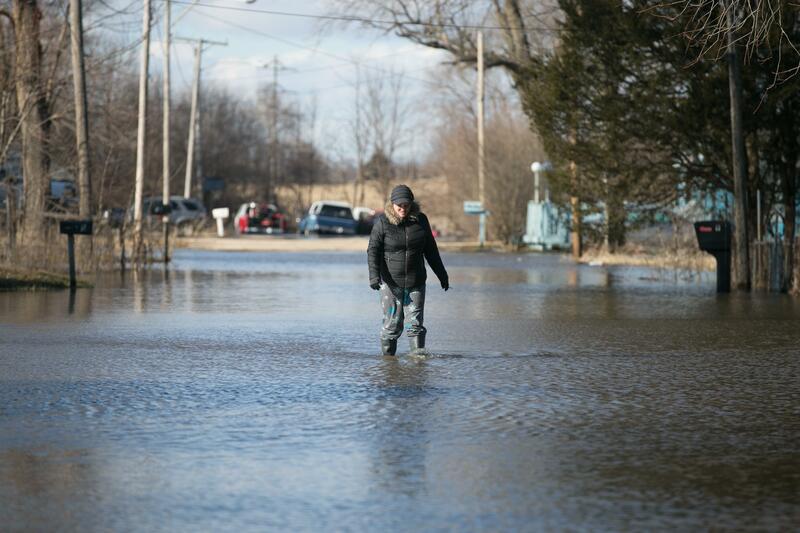 FREEPORT — Major flooding concerns along the east bank of the Pecatonica River prompted city officials to go door to door in the area Saturday evening asking residents if they wished to evacuate their homes. The American Red Cross of Northwest Illinois has opened a shelter at Highland Community College’s Student Conference Center at 2998 W. Pearl City Road to help people who are affected by flooding. While no flood-related injuries have been reported, Crow urged residents to exercise caution. An all-too-familiar scene is playing out yet again along the Rock River north of Rockford. Residents living on the banks of the swollen river in Machesney Park and Rockton are also dealing with major flooding. According to the National Weather Service, the Rock River at Latham Park in Machesney Park reached 13.92 feet as of Saturday afternoon, exceeding major flood stage. The river is expected to crest at a record 14.4 feet early Tuesday morning. Machesney Park resident John Sedlak’s home along Shore Drive is relatively unscathed for now. Harry Buck has lived on the river at 7904 Shore Drive since 2007. His backyard is underwater. The Rock River is expected to reach near record levels in Rockton on Monday. Floodwaters have overtaken much of Blackhawk Park and Marinelli Field in southeast Rockford. The American Red Cross of Northwest Illinois opened a shelter Friday night at Brooke Road United Methodist Church. As of Saturday afternoon, a woman displaced from her home on Blackhawk Island was the only person taking refuge in the shelter. -Winslow Road, Illinois 73 at Bridge Street in Winslow in Stephenson County.